Fall brings us many reason to enjoy oysters. 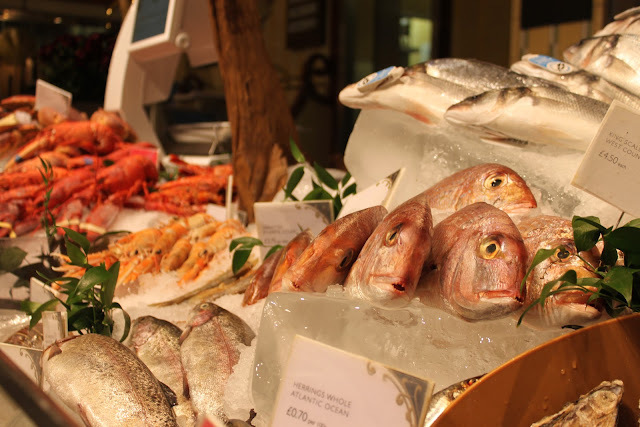 Not only is October National Seafood Month, a time to highlight smart seafood choices, sustainable fisheries, and the health benefits of eating a diet rich in seafood, but. with the holidays approaching, there’s nothing better than oysters to jazz up a meal or party. To celebrate, Jamestown Seafood has developed a few new oyster recipes for the Fall harvest, that can fit perfectly into your Thanksgiving dinner or holiday parties. Their mission was to create artfully crafted and healthful recipes that complement the new Sequim Bay oysters, never masking the delicious and distinctive flavors that they provide. And considering the bounty of a Fall harvest and oysters, the possibilities are without limit. Think pears and apples in a lovely relish spooned over oysters; quince paste or sauerkraut deliciously paired with oysters; beet, pumpkin or sweet potato soup with a dollop of Crème Fraiche topped with plump juicy oysters; or finely dice d fennel added to your favorite Mignonette. Figs, leeks and pomegranates all pair wonderfully for with raw oysters and those tasty end-of-season heirloom tomatoes can be whizzed up to make a lovely tartar with a dash of Tabasco, Worcestershire and fresh horseradish (also in season). deep red wines, oysters aren’t amiss with these either, and when cooking, you can incorporate a rich and creamy beer (such as Guinness) or a mulled, delicately sweet cider into recipes, such as risotto. Topped with a few Sequim Bay oysters, and stud with mushrooms or squash, it doesn’t get much better. And for cozying up in front of a mesmerizing log fire, think oysters dipped in a nice red wine reduction. time of year (not that we ever need a reason to enjoy them). Vitamin B12 and Iron, these morsels are nature’s perfect dietary supplement. addition, and since you tend to eat them slowly, you will fill up sooner. boost of Iron for energy, and help to ward off winter colds and flu. Bay (pronounced “skwim”) along the Strait of Juan de Fuca and just before the entrance to the Puget Sound. further along and deeper into the Puget Sound, the oyster industry is witnessing the emergence of something entirely new, distinctive and extremely delicious. Oyster production begins at the company owned hatchery, embracing scientifically regulated and meticulously managed spawning and seed grow out procedures. Maintaining a watchful eye on their oyster beds throughout the maturation process, Jamestown Seafood enjoys harvests that are commercially viable, sustainable, consistent, and abundant. Jamestown Seafood produces two varieties of Pacific Oysters (crassostrea gigas): Sequim Bay Jades (Beach Farmed), silky smooth, with unmistakable brine, subtle sweetness and a fresh cucumber finish, and Sequim Bay Blue Opals (Tumble Farmed) which are plump, juicy and succulent, display a clean ocean flavor accompanied by subtle sweetness and buttery texture. The company also recognizes the delicate balance that must be maintained between a thriving watershed and an economically viable commercial fishery. Working in cooperation with local, state and federal agencies, and moving beyond shellfish that are commercially sustainable today, the company is exploring ways to restore once prized, and now depleted, indigenous species. 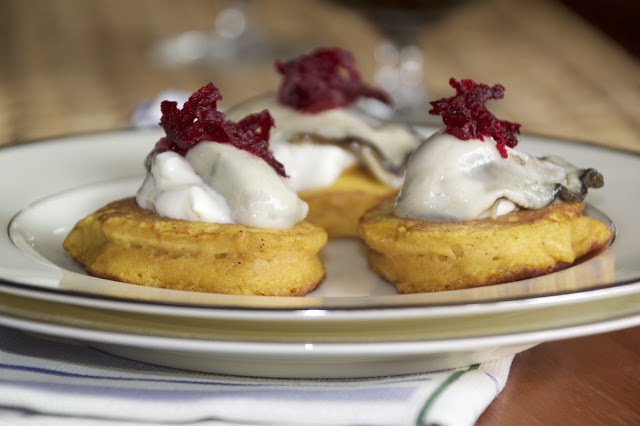 These Blini have the sweet earthy tones of pumpkin, richness of ale, and make a deliciously moist base for mouthwatering oysters. A burst of color and tang comes from the beet, and silky rich cream, making them a spectacularly delicious bite for parties or appetizers. To make the relish, place the grated beet in a small flat bowl. In a small saucepan, combine the vinegar with the sugar over medium high heat until it just simmers, then pour over the beet. Allow to sit for 10 minutes, stirring occasionally, then drain, cover, and refrigerate until ready to use. To make the blinis, sift the flours together in a large bowl. In a separate bowl, beat the pumpkin, oil and egg together, then stir in the light and stout beers. Stir this mixture into the flour until combined. Season to taste. Heat a few teaspoons butter in a large non-stick pan over medium heat. Using about 2 teaspoons mixture per blini, you’ll have room in the pan to make 4 - 6 blinis at a time, depending on the size of your pan. Cook each blini for 2 minutes per side, or until golden brown. Transfer to a wire rack to cool while you cook the remainder, adding fresh butter each time. To serve, spoon a dollop of Crème Fraiche onto each blini, top with an oyster, followed by a small mound of relish. Enjoy with a glass of your favorite stout. 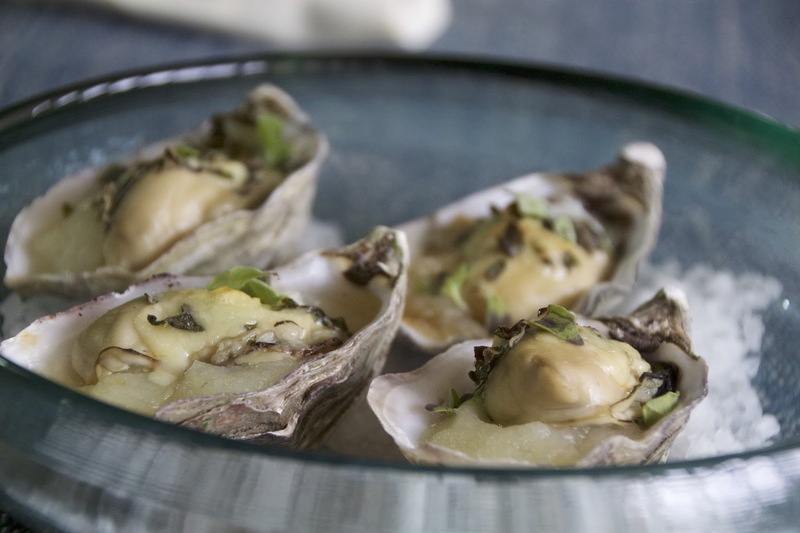 Perfect for the cooler months, these oysters nestle in a silky, sweet bed of pear with the bite of horseradish. A delectable contrast to the warm broiled oyster and crusty cheese, and perfect with a red wine or cider. Remove the oysters from their shells and set aside, then wash and dry the shells. To make the puree, place the pear, lemon juice, and water in a small saucepan. Bring to a simmer and cook for 5 minutes, or until the pear is tender. Cool slightly, remove lemon, drain and transfer to a small blender. Add the horseradish and lemon zest and puree until smooth. Cover and store in refrigerator until ready to serve. In a small bowl, combine the cheese and herbs. Spoon a small mound of puree into the bottom of each shell, top with an oyster, followed by a small mound of the cheese mixture. Place the oysters on a baking sheet and broil until golden brown, about 5 minutes. 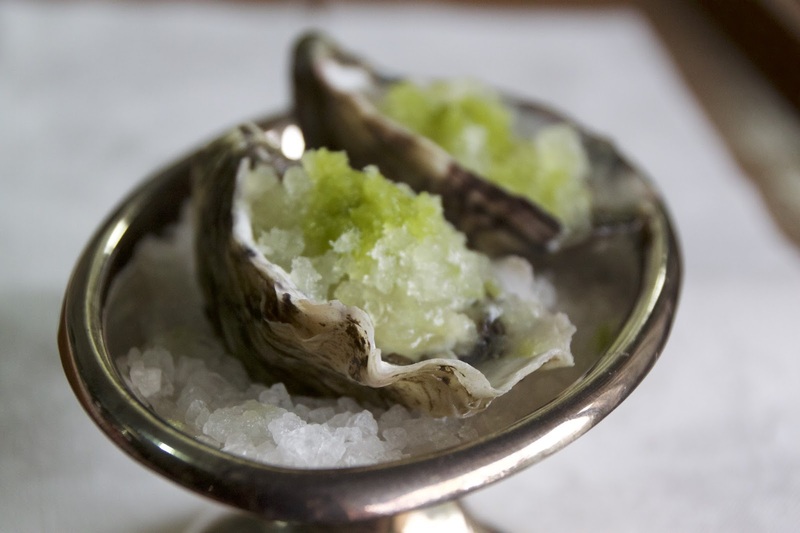 Delightfully fresh and tangy, with a touch of sweetness, this Granita adds a wonderful sparkly touch to plump oysters tasting of the ocean. It’s also very simple. A drizzle of basil oil brings a fresh herbaceous note. Great with mint too. It’s an ideal way to use up the last remaining basil from summer. This will make more than you need to use as you wish – lovely for dipping toast. To make the Granita, dice the apple finely, with the skin, and place in a small blender. Add the Champagne and blend until smooth. Pour this mixture into a large flat tray, cover and place in the freezer overnight. To make the Basil Oil, blanch the basil leaves in boiling water for 10 seconds, plunge into iced water to stop the cooking, place on absorbent paper and squeeze out the water. Chop the prepared basil, transfer to a small blender, add the oil, and puree until smooth. If desired, strain through a fine sieve or muslin. Just before serving, remove the Granita from the freezer and scrape into crystals with a fork. Spoon on top of oysters in shell and drizzle with a little of the oil. Indulge immediately, with a glass of the remaining bubbles!